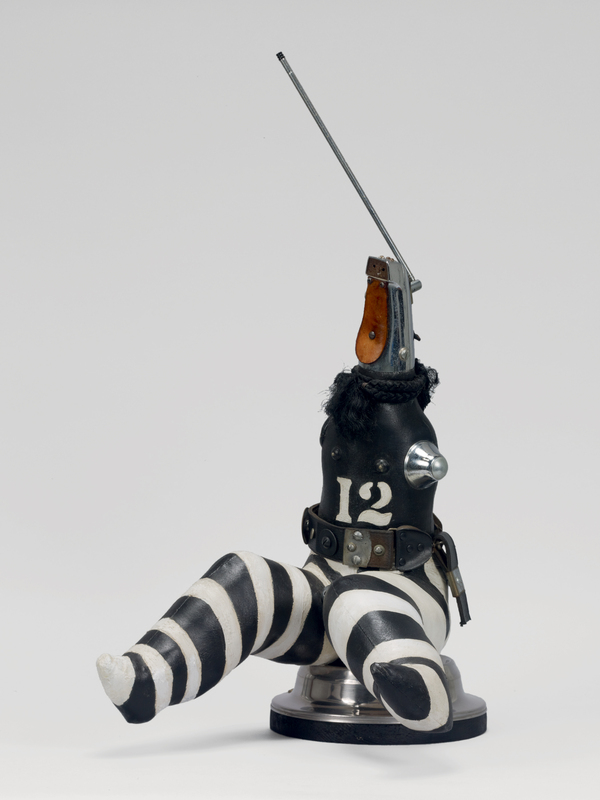 Captive Image #4 is an assemblage sculpture of a figure with black and white stripes on the legs, a broken leather strap around its waist, and the number 12 written on the torso, referring to the uniform of a prisoner. In place of a head, there is a radio or television screen with an antenna, which may suggest someone who is "tuned in" and therefore potentially caught up with media propaganda. "Captive Image #4, from the Ethnic Heritage Group." Now Dig This! Art in Black Los Angeles, 1960–1980 Digital Archive. Los Angeles: Hammer Museum, 2016. https://hammer.ucla.edu/now-dig-this/art/captive-image-4-from-the-ethnic-heritage-group.